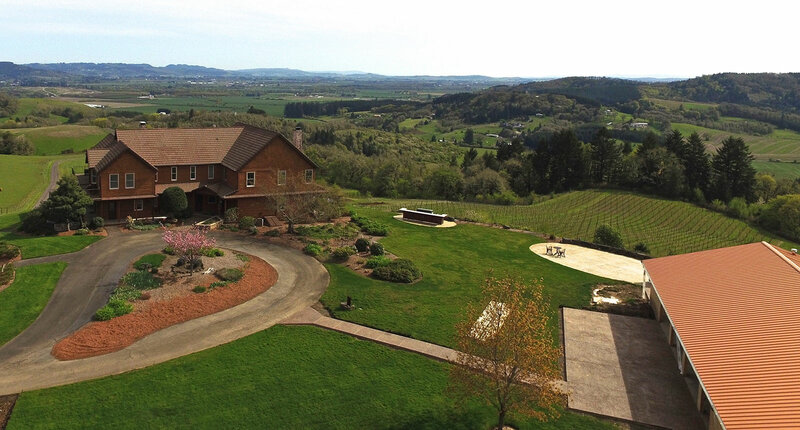 Youngberg Hill, the versatile winery/vineyard/lodging/event destination located on a gorgeous hilltop setting outside of McMinnville, has added an expansive, indoor/outdoor Event Center that will now allow for year-round wine events, weddings, meetings, music and other special events. After years of planning and design, owner Nicolette Bailey has overseen the construction of a handsome, 3,600 square-foot building on the lawn behind the inn overlooking the vineyards and valley, with the ability to seat as many as 200 people. Fully enclosed and protected from the elements, the Youngberg Hill Event Center takes advantage of the magnificent natural setting by way of eight glass rolling garage door-type openings that open up to the views that the property commands, while providing full shelter when inclement weather arrives, with the ability to transition quickly to indoor use. 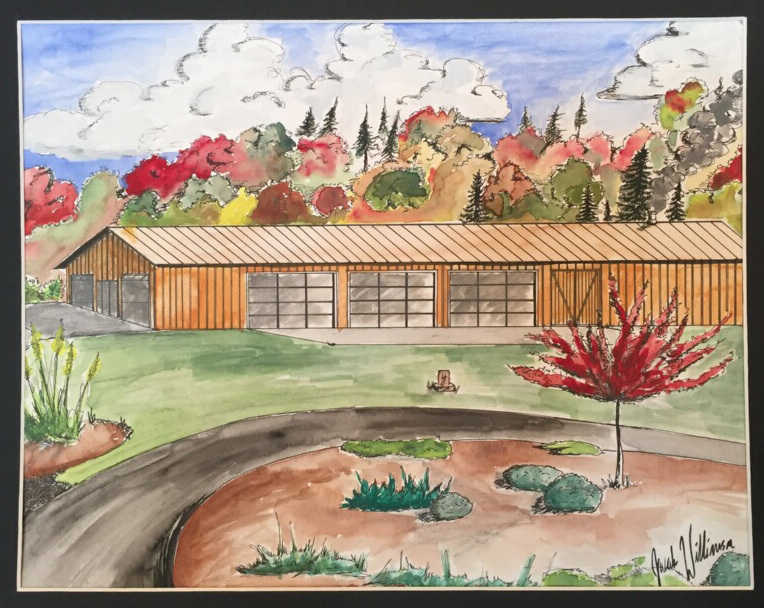 The handsome Event Center complements the existing structures of Youngberg Hill, with a poured and polished concrete floor and a ceiling trimmed with parquet fir strips. Bright white walls provide the perfect backdrops for wedding decorations and photography. The eight glass garage doors offer views from three sides of the building, let in tons of natural light, and open quickly to seamlessly integrate the outdoors. Siding on the outside of the building mimics the stained cedar siding of the nine-room, lodge-style inn. Outside the space, a new patio adds approximately 900 square feet of poured and stamped concrete flooring that can accommodate a 20 x 30-foot tent for even larger parties and events. Existing restrooms on the property are tucked into a hillside behind the new building and reached via covered walkway. The building also has a catering kitchen for vendors to use in preparing food. The existing outdoor wine-tasting bar and circular concrete pad for weddings, both of which are back-dropped by astonishing views of vineyards, farmlands and wooded hills, complete the versatile event space. Besides hosting more than 26 weddings a year, and concerts for Linfield College, Habitat for Humanity, the Salem Orchestra and many others, Youngberg Hill continues to be a wine grower and producer of premium Pinot Noir, Pinot Gris and Pinot Blanc from estate vineyards that surround the inn and contain some of the oldest vines planted in the McMinnville area. Wayne Bailey is the winemaker, with guidance and the facilities of Robert Brittan. The Youngberg Hill tasting room is located inside the inn for drive-up visitors. Bailey added that this year’s Wine Wednesday events will begin on June 8th, with live music, food truck and later hours for tastings, including an outdoor tasting bar that captures views of the vineyards and valley. Bookings for the Youngberg Event Center will be handled by Nicolette Bailey at 503-472-2727, or by emailing info@youngberghill.com. Media Inquiries: Contact Carl Giavanti at 971.221.4212 or cgiavanti@mindspring.com for additional information, photos or to arrange a visit, tour and tasting.